A professional organiser is someone trained, skilled and experienced at organising spaces, anything from a cupboard to a room to an entire house (including the garage!). Some, like me, also specialise in the digital side of organising, helping to sort, store, and showing you systems to handle paperwork, photos, and other important documents. Who hires a professional organiser? Anyone and everyone! There are many different reasons that someone may want to hire my services. You might feel overwhelmed by the sheer amount of “stuff” in a space. All of this “stuff” making it almost impossible for you to use the area as intended. Has your laundry become a dumping ground? Maybe it’s your loungeroom, or the garage that just never gets sorted. I can work with you, step by step, to make the space not only useable again, but also show you how to keep it useable. You may not have the “organising gene”. We don’t all know how to farm crops, service a car, cook a 5-star meal and perform minor surgery! We all have different skills and interests; if sorting and organising isn’t one of yours, you can hire a professional organiser to do it for you. You might not have the time to organise that space. No matter how big or small it might be, if you’d rather be watching your kids playing sport, spending your free time out with friends or family, taking the dog for a walk or even quietly reading a book, I can help organise the space that’s cluttering up your life and start you doing the things you really want to be doing. Simply contact us, let us know what your needs are, what spaces you'd like organised, and any other details you'd like to include. We will then contact you and set up a time to meet. 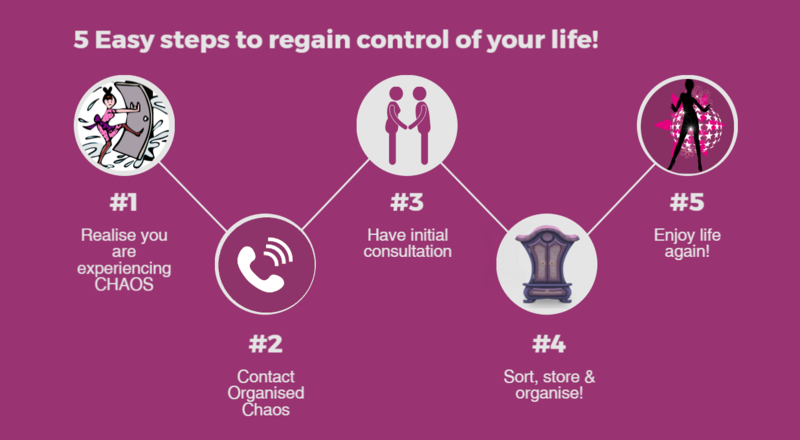 Organised Chaos provides a free consultation to establish your needs, what you would like to see change and what is currently working for you. This gives you an opportunity to get to know us, understand how we work, and helps us understand your needs. Do you do the organising work with me or just help me get started? We provide hands-on organising, working with you every step of the way. However if you'd prefer us to do it all, we can do that too, it's up to you. Will I be in control of what stays and what doesn’t? We work with you every step of the way. You tell us what items are precious to you, and show us what items you are ready to part with. We can suggest great ways to store and protect those items that matter the most to you, so they are there in years to come, and for those items that are cluttering up your life and serving no useful purpose, we know what can be resold, reused or recycled. We can help you organise items for a garage sale, suggest charities that have collection or drop-off points, as well as other recycling options. Our Resources page contains more information. We accept cash and direct deposit. Payment in full is required at the end of each organising session. What are your fees & charges? We know everyone's needs are slightly different, contact us to tell us about about your spaces and we'll advise on the package that can be tailored to suit your needs. Yes. Should you need to cancel or reschedule your appointment, please contact us at least 48 hours prior. We can then reschedule the appointment. Failure to contact us will require full payment for the missed appointment. We keep all client information strictly confidential and respect your privacy. We won't publish any “before” or “after” photographs without your permission. We hope this will not occur but sometimes accidents are unavoidable. Organised Chaos is not responsible for breakages.